"Has six stainless steel burners and 60,800 BTUs of cooking power." "Natural gas grill with porcelain-enameled cast iron grates." "There are porcelain-coated heat tents that create flavorful smoke." "The cooking grates will leave impressive grill marks on your steaks and chops." "You’ll get a lot for your money with this large, six-burner grill." "This handy tabletop grill is great for anyone who doesn’t have the space." "This built-in grill is made from stainless steel that will last for years." "Comes with a rotisserie with a 13,000 BTU rear burner." This grill has everything you need—and probably more. It also looks great, with a brushed stainless steel exterior, closed cart, large control knobs that can light up, and lights on the generous handle, so you can focus them on the grill surface to cook after the sun has gone down. 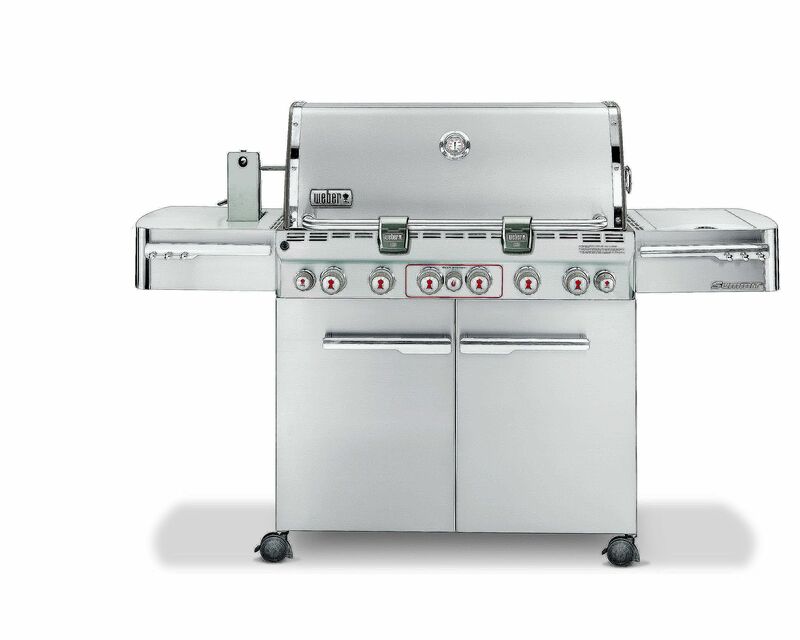 This has 60,800 BTUs of cooking power, 624 square inches of primary grilling space, plus a 145 square inch warming rack and a side burner, so you can grill your burgers, keep your burger buns warm, and simmer a sauce all at the same time. Six stainless steel burners let you use the entire grill or just part of the surface. A sear station burner gives extra heat to sear your steaks and chops before moving them to a cooler section of the grill to finish the cooking, while a smoker burner sits under the area that holds the smoker box, to add flavor to all of your food. A rotisserie motor stays hidden until you need it, then pops up to hold the long spit that can easily hold two chickens. An infrared rotisserie burner cooks the food from the side rather than the bottom so you won’t get flare-ups during cooking. The grilling grates are thick stainless steel rods that will never chip, rust, or corrode, while they retain heat and create impressive grill marks. Two generous side tables, covering the simmer burner and rotisserie motor when they’re not in use, give you plenty of space for plates and sauces, and hooks give you room to hang tools and towels. Flavorizer bars over the burners vaporize fats and juices, keeping the burners clean and creating flavorful smoke. Any drippings that bypass the bars are funneled to a collection tray inside the cart, for easy cleaning. If you're looking for a natural gas grill that won’t destroy your budget, this grill is a great option that will be a workhorse for years to come. It boasts many of the same features as more expensive Weber gas grills, but in a smaller size. It has three burners and a generous 529 square inches of cooking space, plus a warming rack. The cooking grates are porcelain-enameled cast iron that won’t rust or corrode, while they provide great grill marks and even cooking, taking advantage of the 30,000 BTUs of cooking power. The grates are reversible, with thicker and thinner sides for cooking different types of food. Flavorizer bars above the burners vaporize drippings to create flavorful smoke. This has an open cart for easy access to storage, and tool hooks to keep your tongs and towels close at hand. The left-side side table folds up to hold your plates and condiments, then folds down out of the way when not in use, while the other table remains permanently in place. For less than the cost of a high-quality kitchen knife, you can add this grill to your outdoor cooking space. It offers 449 square inches of total cooking space, three stainless steel burners, and 24,000 BTUs of cooking power. The main cooking area is 310 square inches, with an additional 139 square inches of space on the warming rack. The cooking grates and warming rack are made from porcelain coated steel, and there are porcelain-coated heat tents covering the burners that vaporize food drippings to create flavorful smoke. Two side shelves give you space for your tools and sauces, while the closed-front cart hides the propane tank from view while making it easily accessible from the side. For under $300 you can buy a grill that has two stainless steel burners that provide 24,000 BTUs of grilling power. The Char-Broil Performance 2-Burner Cabinet Gas Grill also boasts 300 square inches of cooking space and a 100-square-inch warming rack. The cooking grates are made from porcelain-enameled cast iron for even heating and impressive grill marks on your steaks and chops. Electronic ignition gives you a sure start every time with just the push of a button. The closed cart gives you out-of-sight storage for your propane tank, tools, and supplies, while two side tables give you space for plates and sauces while you cook. The side tables fold down when not in use to save space in the grill area. This has two locking casters and two non-locking, so you can roll this across your deck with ease, then lock the casters to keep the grill from rolling if it’s bumped. When cooking is done, the grease pan is removable, and it’s coated with porcelain enamel for easy cleaning. You’ll get a lot for your money with this large, six-burner grill, and it also includes a grill cover, saving you even more. This has 560 square inches of primary grilling space, plus a 200 square inch warming rack, along with a 15,000 BTU ceramic searing side burner. Electric ignition makes start-up easy every time, a built-in thermometer lets you check the temperature during cooking, and a rotisserie kit is included for more versatility. Each of the main burners provides 10,000 BTUs of cooking power, and angled flame tamers prevent flare-ups and create flavorful smoke from drippings. The grates are porcelain-enameled cast iron for easy maintenance and impressive grill marks. When grilling runs into overtime, LED lighting illuminates the control panel, so you can see the settings. This has four heavy-duty locking casters, so you can position the grill in exactly the right place, then lock the casters to keep it from moving if it gets bumped. This handy tabletop grill is great for anyone who doesn’t have space for a larger grill, or for folks who like the idea of traveling with their grill. This has a cast aluminum lid and body along with a glass-reinforced nylon frame that provides a sturdy, weatherproof exterior with lighter weight than similar steel grills. The porcelain-enameled grill grates offer the same even heat and grill marks you’d get from larger grills. This has a tall lid that lets you cook larger foods, and split grates that give you versatility since you can replace one or both with a griddle (sold separately). A built-in thermometer on the lid lets you monitor the internal grill temperature at a glance. This has a single stainless steel burner that produces 12,000 BTUs of cooking power and electronic ignition for easy starting every time. The electronic ignition requires one AAA battery. Folding side tables give you space to hold your tools and sauces, and a removable catch pan collects drippings for easy cleaning when cooking is done. While this runs on the smaller disposable LP canisters, an adapter hose is sold separately that can convert this to use a 20-pound tank for more convenient home grilling. A cart is also available to convert this to a standing-height grill. When your outdoor cooking area is actually an outdoor kitchen, this built-in grill will be a perfect fit. It’s made from stainless steel with chrome accents that will look attractive and last for years. Three stainless steel burners and one infrared grill burner provide 16,000 BTUs of cooking power each, while a rear infrared burner provides an additional 15,500 BTUs. This offers a total of 850 square inches of total cooking space and the wave-designed grill grates have integrated sear plates so you can start off with evenly high heat, then move to a cooler part of the grill to finish the cooking process. The plates also protect the burners from flare-ups due to grease, while the wave pattern on the standard grates produces a unique pattern of grill marks. A total of 696 square inches of cooking space, plus a rotisserie with a 13,000 BTU rear burner, along with a 15,000 BTU ceramic searing side burner, gives you plenty of cooking options. There are four main burners that produce 10,000 BTUs each for a total of 68,000 BTUs of cooking power overall. The cooking grids are wrapped with stainless steel so they won’t rust or corrode, while they also retain heat well and provide great grill marks on your steaks and chops. Angled flame tamers over the burners prevent flare-ups and turn drippings into flavorful smoke. A warming rack keeps your cooked food at serving temperature or warms your burger buns, and a built-in thermometer lets you monitor the temperature inside the grill with ease. When it’s time for cleanup, the catch-pan is accessible from the front, for easy cleaning and less mess. Our writers spent 4 hours researching the most popular gas grills on the market. Before making their final recommendations, they considered 18 different grills overall, screened options from 10 different brands and manufacturers, and read over 12 user reviews (both positive and negative). We then bought one of the most popular mid-range gas grills available and our reviewers spent 15 hours testing it. To get the most thorough feedback, our testers took this grill home and put it to good use cooking for themselves and their families. They also analyzed the grill’s key features — from its size to its special add-ons — to see what its strengths and flaws really were. We’ve outlined the key takeaways here so that you, too, know what to look for when shopping. Special features At this price range, you can expect that every grill will do a great job cooking hot dogs, grilling steaks, and charring ears of corn, so the purchasing decision might rely on the grill’s unique add-ons. Do you want lights, a smoker, a rotisserie, or a side burner? There’s no wrong answer — it just depends on how you like to cook. Size When you buy a grill, you have to find a place to put it. In a large yard, size might not matter, but on a patio, you might prefer a smaller model. Size also affects portability. While you probably won’t take your gas grill tailgating, you might want to move it to a new location, into storage for the winter, or just a few feet to the left so you can clean behind it. ﻿Burners Your grill’s number of burners and power output both play a part in how you’ll use it. With more burners, you’ll have more ways to cook in different zones at different temperatures — plus, it’s easier to cook over indirect heat. Burner power, on the other hand, affects the speed of cooking, preheating time, and searing power. This grill’s large amount of cooking space impressed our testers, with one person observing that it can “easily fit 25 standard burgers” at a time. One reviewer also summed up the unique features he loved: “I like the three zones (to be able to cook at three different heats depending on the food); the side burner (to be able to heat up a pan or additional pot); and the gas indicator on the face of the grill is handy.” However, our testers did wish that the grill came with built-in drawers and a cover to protect it from the elements.